As stated in the Part 4 of this article series, once the Hyper-V cluster is deployed, it is necessary to make sure that Hyper-V cluster is configured correctly by looking at the property page of the Hyper-V cluster. In part 4, we explained General and Status tabs. General tab contains Hyper-V cluster information such as Hyper-V cluster name, cluster reserve nodes number and reserve status. You can also specify the description on the General tab to identify the role of the Hyper-V cluster in the production. Status tab also shows you the overall status of the Hyper-V cluster including cluster service status on all nodes in the Hyper-V cluster. Available Storage Tab: Available Storage tab, as the name suggests, shows you the shared storage disks that have been added for use by the Hyper-V Cluster as shown in the figure below. As you can see, there are four disks that have been added to the Hyper-V cluster from the “Storage1” VMM storage classification. You can also see free space and total capacity of each disk. 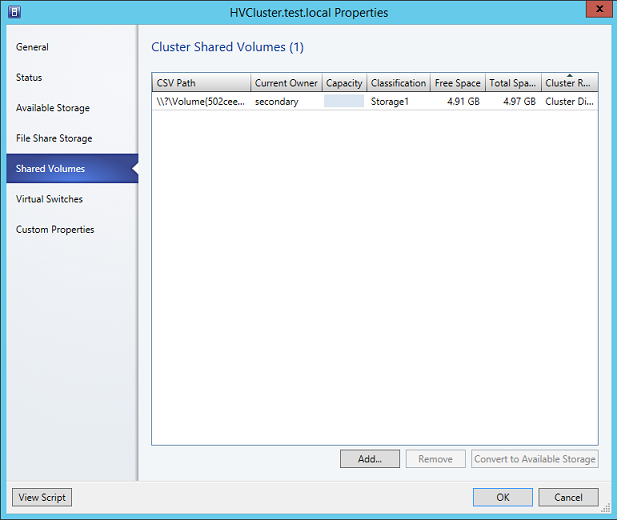 Note that Available Storage tab also shows you the Cluster Resource name that has been created for each disk in the Hyper-V cluster as it is indicated by the last column in the figure above. There are three buttons available on the Available Storage tab; Add, Remove and Convert To CSV. Add button allows you to add additional shared storage disks to the Hyper-V cluster, Remove button allows you to remove and release the shared storage disks from the Hyper-V cluster and Convert To CSV button allows you to convert a shared storage disk to a CSV disk. When you click on the “Add” action button, you will be asked to select the disk from the available storage to be added to the Hyper-V cluster. In case there are no disks available, you can always create one by clicking on “Create Logical Unit” button as shown in the figure below. Once a logical unit has been created, give it a volume name, select partition style, and format the disk as shown in the figure below. After adding the disk to the Hyper-V cluster, click Ok. Clicking Ok will instruct VMM to create a PowerShell Job that will register the disk to the existing Hyper-V cluster as shown in the figure below. 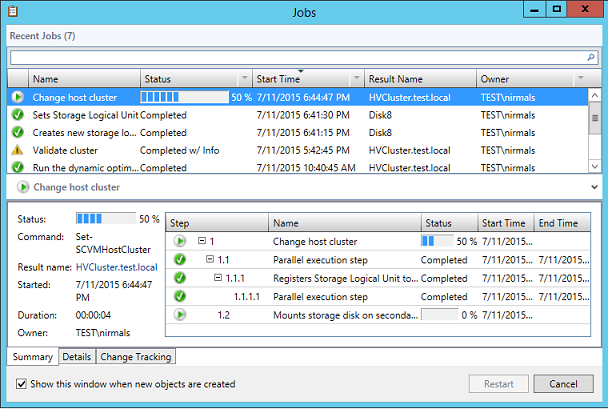 You can add as many as disks to the Hyper-V cluster via VMM. 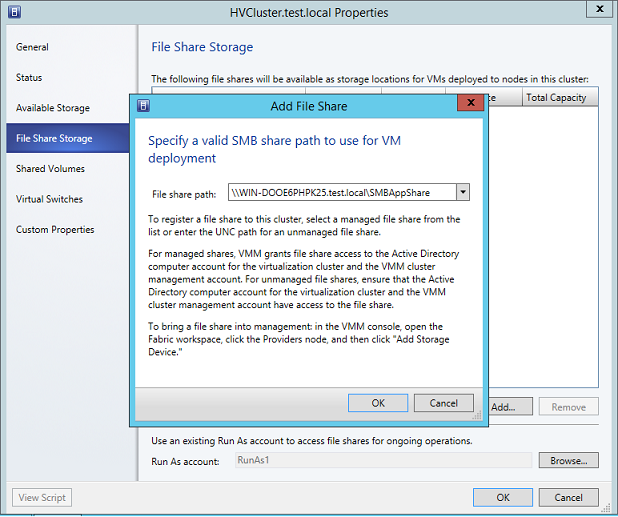 Adding shared storage to a Hyper-V cluster via VMM is very easy. VMM takes care of formatting and registering the disk to the Hyper-V cluster, which, in turn, helps in reducing the time it takes if you want to add a disk manually to a Hyper-V cluster. Removing a disk from a Hyper-V cluster is easy, but pay attention to the existing workloads that might be running on the disk that is being removed. It is imperative to understand that removing a disk from an existing Hyper-V cluster might result in downtime of the Hyper-V services. 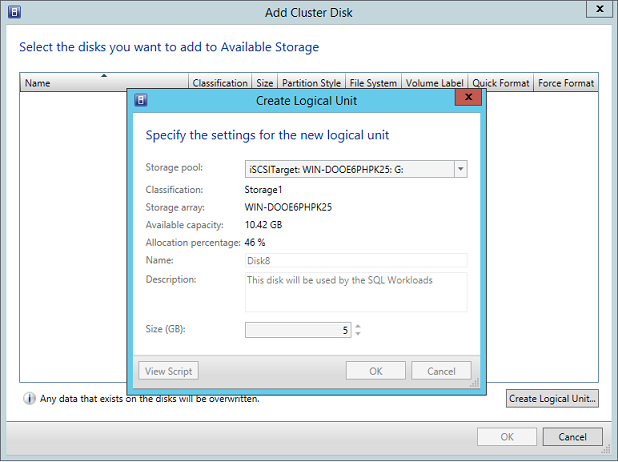 When removing a disk from existing Hyper-V cluster, VMM just unregisters the disk from the Hyper-V cluster. The disk will still be available to VMM to be used for other purposes. Convert To CSV button helps you convert a shared storage to a CSV disk. A CSV disk is required by Hyper-V Live Migration. Converting a disk to CSV is a simple process. Just click on the disk that you want to convert to CSV and then click on the “Convert To CSV” button. Once converted, you will see the converted disk under the Shared Volumes tab as shown in the screenshot below. VMM provides support for both Block-based and file-based storage. Block-based storage such as Fibre Channel, iSCSI and serial attached SCSI (SAS) storage devices and file-based storage such as an SMB 3.0 file share created on a Windows Server 2012 and later operating systems are supported as clustered shared storage in VMM. In case you need to have an SMB file share available to the Hyper-V cluster, switch to File Share Storage tab. File Share Storage Tab: File Share Storage Tab lists the file shared storage that have been added to the Hyper-V cluster. In case you need to add new file shared storage, click on the Add button. Note that when you click on the Add button, you will be asked to provide a complete path of SMB share as shown in the figure below. As it says on the “Add File Share” page, VMM is expecting you to provide a valid SMB share path in the UNC format. Once you have specified the UNC path of the SMB share, click Ok for VMM to make the SMB share available to the Hyper-V cluster as shown in the figure below. When you click Ok, a VMM Job will be created that will register the SMB share with the Hyper-V cluster. The “Repair” button on the File Share Storage Tab allows you to rectify any access issues with the SMB share. In case “Access Status” column for the SMB share does not report “Ok”, click on the Repair button to rectify any possible issues. Note that on the File Share Storage Tab, you must also make sure that you have assigned a VMM Run As account that will be used to take corrective actions in case SMB share is in warning state or some issues with the SMB share. The “Remove” button, as the name suggests, helps you remove the SMB file share from the Hyper-V cluster. When you click “Remove” and “Ok”, VMM unregisters the SMB file share from the Hyper-V cluster. 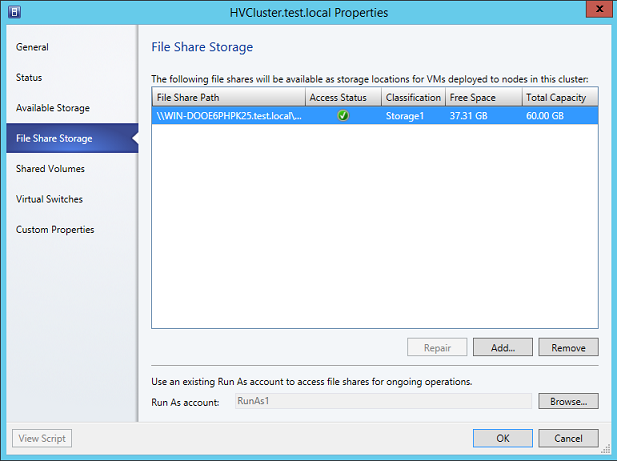 VMM does not delete the SMB share. 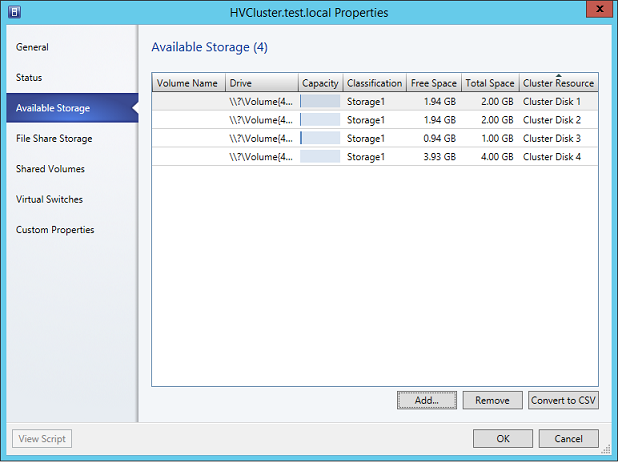 This article explained “Available Storage” and “File Shared Storage” tabs available on the property page of a Hyper-V cluster and how you can use these tabs to add/remove shared storage, convert storage to CSV and add an SMB file share to the Hyper-V cluster. In the next part of this article series, we will continue to explore other configuration tabs available on the property page of a Hyper-V cluster.